Art of JMW Turner Or Not? Recently, I went to the #AshmoleanMuseum in Oxford with a friend taking with us a watercolour painting. I did so as an an amateur art lover to compare it with the Turner painting which the Ashmolean holds. So here I present my musings on comparing the two pieces. I present to you on the right/below #JosephMallardWilliamTurner – #St.Julians,Tours – which resides in the Ashmolean Museum in Oxford and on the left the watercolour which went with me to Oxford for comparison. It has been suggested that the one on the above/left is a copy – I am not yet convinced of that idea. 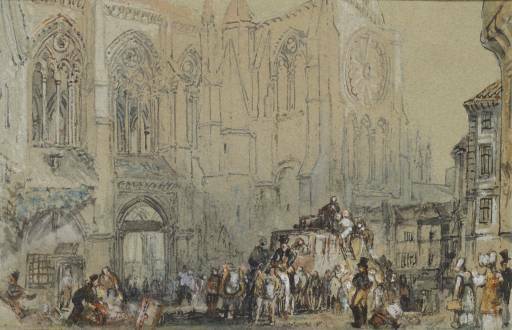 It is possible for the Turner to have been copied since it was not given to the nation until 1861 – leaving roughly 30 years in the public domain for it to be copied – once in the national collection not likely but Turner liked to keep every little scrap of his work in his own possession. Here are my musings for the painting on the left. Firstly, the accuracy of the image in all details tells me that it likely was Turners hand which painted it. The difference in the definition in the church architecture much of which is done in graphite or pencil is not for Turners sake or even the sake of the picture but was in fact for the etcher W. Radclyffe. The variation in colour is definitelty a day night shift. It is historically known that the picture was altered into a night scene for the engraving. If you are copying something not only accuracy of image but also accuracy in colour are essential – here the colour is so different to suggest it is not a copy. I believe the Ashmolean ‘Turner’ to be this altered version from which Turner and Radclyffe collaborated to produce his etching in 1833. If that is so where is the day time version which Turner painted? Is it the one I brought to Oxford? I also find the obfuscation or haziness of the cathedral to be extremely Turneresque – the archectural lines of the church are still very exact. Also the painting which came with me is very slightly larger than the Ashmolean -also known that the night version was somewhat reduced in size- but if mine is a copy how does one know how to finish off the top of the church towers unless one has actually been there. Of course for my friends sake authenticity will have to be proven but not by my musings. I hope you have enjoyed my musings and why not compare the images yourself. I must thank the Ashmolean staff for their welcome and assistance. It was amazing to see and hold so many Turners in my hands. An art lovers extreme moment. 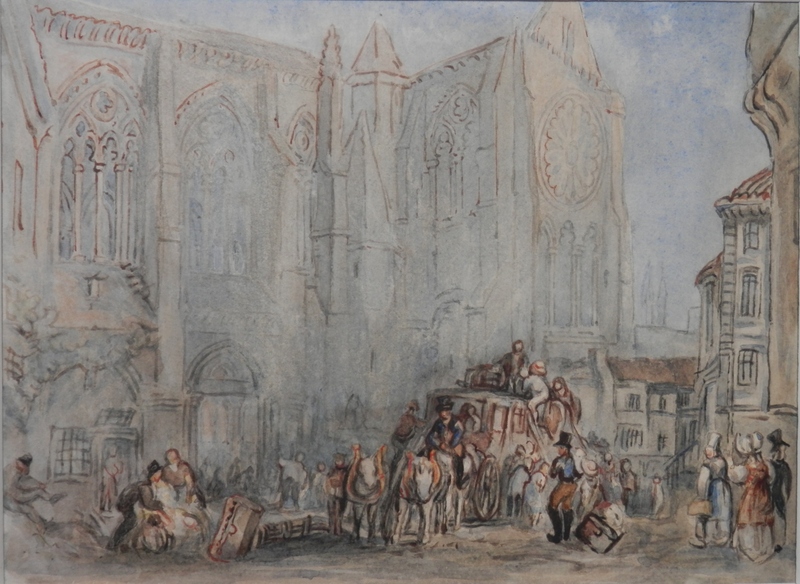 This entry was posted in Watercolour paintings and tagged baggage, church, coach, crowd, horses, JMW Turner, nave, St. Julians, Tours, transept, travellers. Bookmark the permalink.